The Emory Law Career Bass Career Summit brings students, practitioners, and career advisors together for timely information about the career search. Emory Law hosts on-campus programs throughout the year with legal employers from across the country. 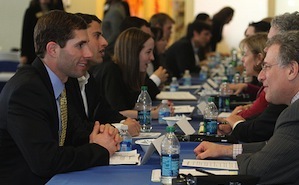 The Career Center connects employers and students through networking events. Beginning with the first year of study, our staff provides one-on-one advising appointments. The Center for Professional Development & Career Strategy serves as the professional link among students, alumni, and employers, coordinating a full range of services for the employment search process. Beginning with the first year of study, our staff provides one-on-one advising appointments, training on job search skills, educational programming about the wide range of career paths available to Emory Law students, and development of career resource materials. We work closely with employers to introduce them to our highly skilled graduates and create networking opportunities that transition students into their chosen career paths. We provide the structure, oversight, guidance, and resources that enable students to explore their unique professional journeys effectively while leveraging professional development and job search resources to their maximum advantage. The Center provides services and resources to assist Emory Law graduates who are conducting employment searches or contemplating career changes. We connect employers and students through our interview programs, online employment postings, career-related panels and presentations, and other networking events. The Career Center provides a variety of career skills and legal career programs, including the annual Speed Networking event, Kagan-Horowitz Practice Society Premiere, and Bass Career Summit. Emory Law's practice societies, a unique feature of the Career Center, are grounded broadly in areas that reflect the way the legal profession has organized itself and provide a hands-on opportunity to bridge legal theory to the real world of practice.